We would once again like to welcome back to our blog, Classics teacher and author of The Elephant of Exeter Change: A Tale of Cruelty and Confinement in Georgian London, William Ellis-Rees. William’s guest post this time has as its subject, Empress Josephine, the wife of Napoleon Bonaparte. Josephine is of course extraordinarily famous, and many biographies of her have appeared over the years. However, William’s research has unearthed a curious story which does not appear in the standard works, and which sheds light on a fascinating corner of her life. 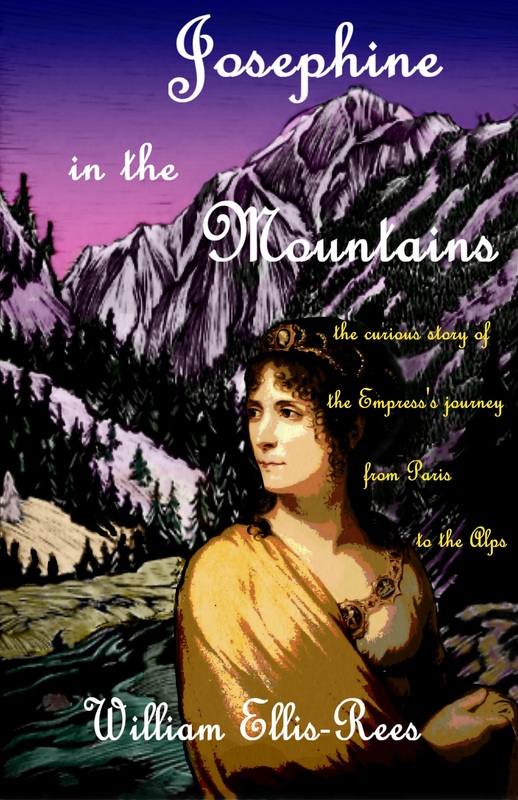 His fascinating book tells more about her obsession with the collecting of animals and plants, Josephine in the Mountains: The curious story of the Empress’s journey from Paris to the Alps. For most visitors to Paris, the château of Malmaison will not be high on their list of must-sees. There are perhaps more obvious attractions: museums and churches, the Seine and its bridges, the grand boulevards and the romantic back-streets. 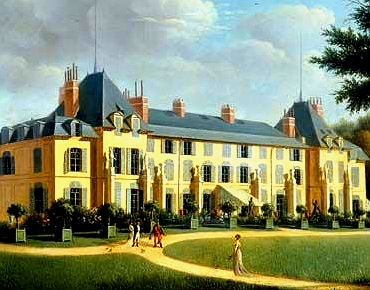 Vue du château de Malmaison (façade sur le parc) by Pierre-Joseph Petit. Musées nationaux de Malmaison, France. But Malmaison, bought by Napoleon Bonaparte and his wife Josephine in 1799, is for those who make the pilgrimage to the outskirts of the city quite simply fascinating. I first fell under its spell many years ago when I embarked on extensive researches into its history, and I still find that it has the power to evoke the atmosphere of the Consulate and the First Empire. The château is crammed with images of Napoleon’s military exploits, and the furniture and furnishings showcase the opulent decorative style he made fashionable. 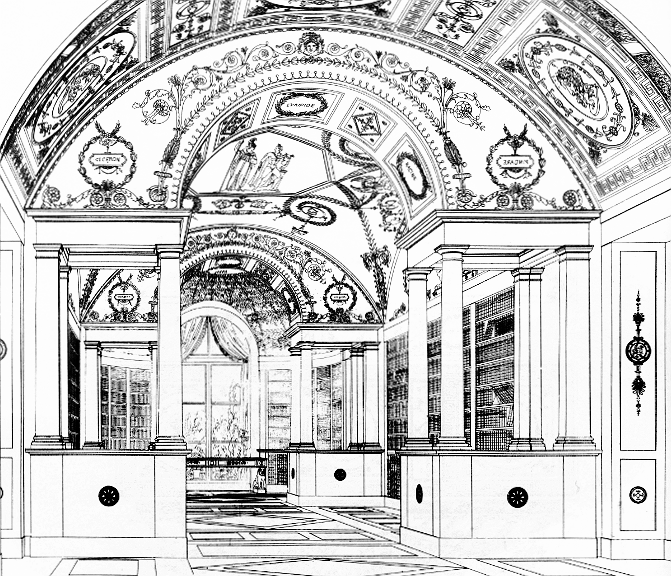 Design for the library at Malmaison in Recueil de Décorations Intérieures by Charles Percier and Pierre Fontaine. But above all it is Josephine’s role in this particular story — a role made possible by her ambition and energy — that gives Malmaison its special appeal. Josephine, who is not always remembered in the most favourable light, was, in fact, a very considerable connoisseur of landscaped gardens. She employed a succession of designers to lay out the park of Malmaison in the ‘English’ style, which called for purling streams, follies and toy farms and apparently natural arrangements of trees and plants. 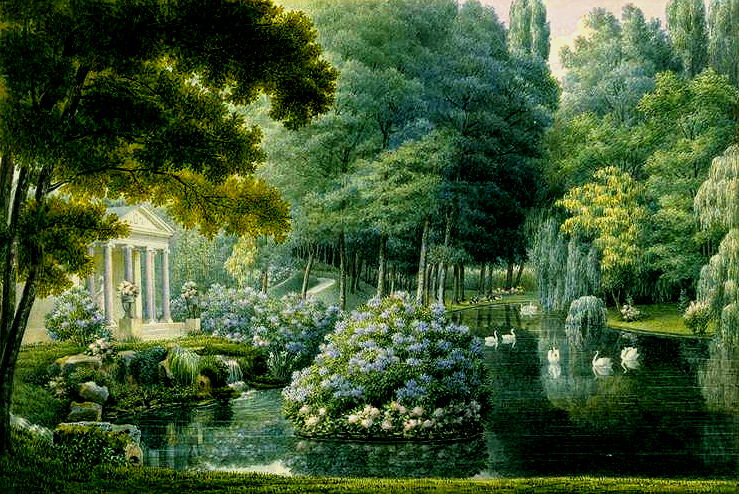 The ‘English’ garden at Malmaison by Auguste-Siméon Garneray. Musées nationaux de Malmaison, France. Josephine was in her element. She used her influence and wealth to turn Malmaison into the centre of an extensive scientific network, along which plants flowed into Paris from the furthest corners of the earth, and then, once acclimatised in her magnificent glasshouses, out to municipal gardens in every region of France. 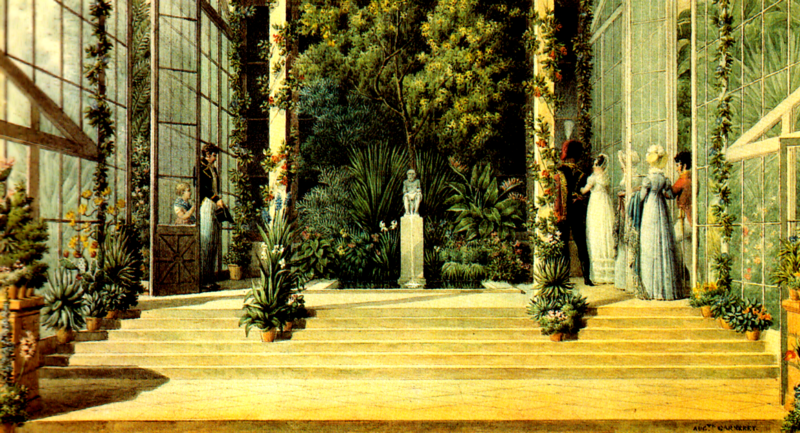 The Great Glasshouse at Malmaison by Auguste-Siméon Garneray. Musées nationaux de Malmaison, France. She collected animals, too, and her exotic creatures turned the park into something not unlike an Old Master’s vision of the Garden of Eden. Josephine’s interest in natural history found triumphant expression in her patronage of the 1800 expedition to Australia, which Europeans then called New Holland. Headed notepaper used by Nicolas Baudin. Muséum d’histoire naturelle, Le Havre, France. 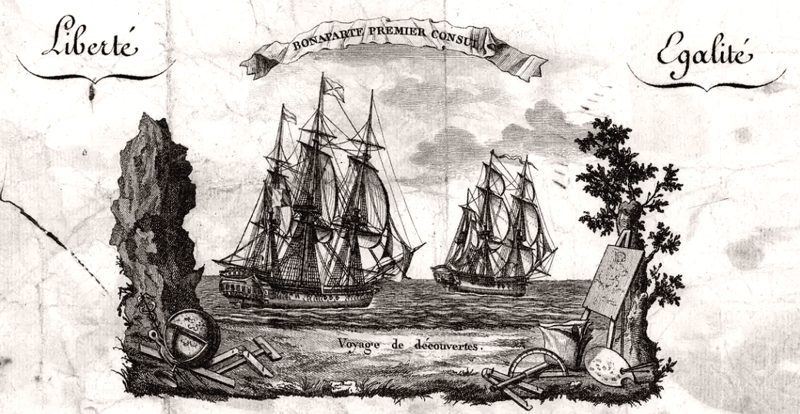 The expedition, sailing in two ships, was led by a seasoned captain, Nicolas Baudin, but he clashed with members of the scientific team — the mariner and the intellectual were not obvious travelling companions! Although the voyage was arduous, New Holland proved to be a land of almost magical beauty, and the ships carried back to France a rich haul of exciting new plants and animals. These had been earmarked for the Jardin des Plantes in Paris, but Josephine was quick to claim her share. And so it was that the glasshouses at Malmaison boasted numerous New Holland species. So it was, too, that black swans floated on the ‘English’ river, and kangaroos hopped about their enclosure in the park. 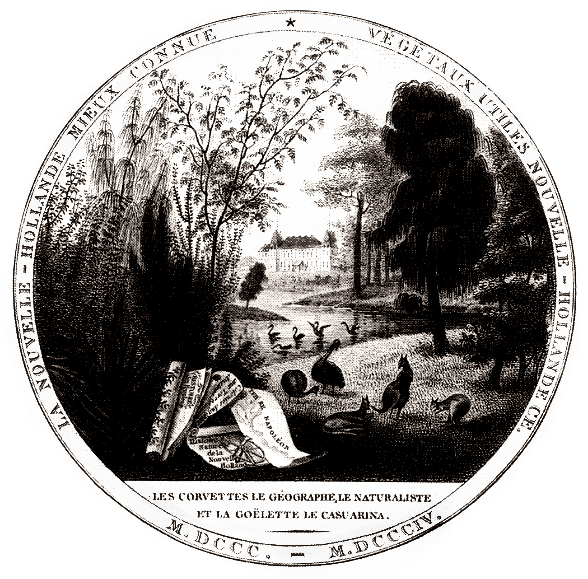 New Holland animals and plants at Malmaison depicted in frontispiece of Atlas du Voyage aux Terres Australes by Charles-Alexandre Lesueur and Nicolas-Martin Petit. Josephine shared with many of her contemporaries a passion for mountain landscapes — she built a Swiss chalet at Malmaison and kept a herd of Swiss cows — and in 1810 she set off for the Alps. She had only recently been divorced by Napoleon, and her journey to the mountains may be seen as in some sense deeply personal, and maybe even as a spiritual process of self-discovery. Given the circumstances — she had been rejected in favour of the powerfully connected Marie Louise — Josephine must strike us as a rather forlorn figure. Even so, she travelled with a graceful entourage and was fêted along the way. 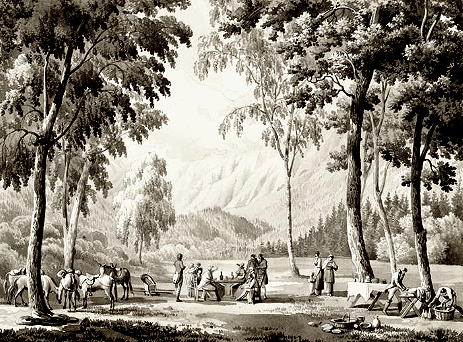 Josephine picnicking with her companions at Servoz in the Chamonix valley by Lancelot-Théodore Turpin de Crissé. Musées nationaux de Malmaison, France. One day a young man by the name of Joseph-Louis Bonjean was introduced to her. What happened as a result of this meeting is an intriguing story, and, if you want to find out more, I would urge you read my recently published Josephine in the Mountains! 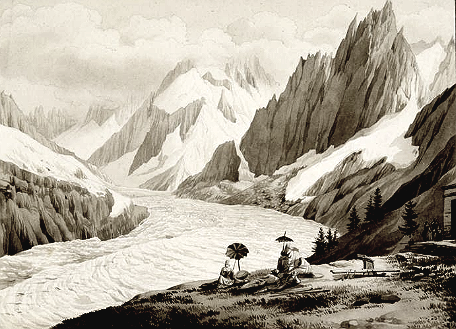 The Mer de Glace in the Chamonix valley by Lancelot-Théodore Turpin de Crissé. Musées nationaux de Malmaison, France. Suffice it to say here that for one of the two travellers, the illustrious Josephine and the humble Bonjean, nothing was ever the same again. As one might expect, they later went their separate ways, but, as I show in my book, Bonjean’s name was not entirely lost. What we have here is perhaps not the obvious story of Josephine. My concern is not principally her rise to prominence, nor her marriage to and her divorce from Napoleon. My story is about another — the other — Josephine. I think the English Garden design appealed enormously to Josephine, as it still appeals to us today. The lack of rigid formality in the planting of trees was relaxing, as were the the curved paths, bridges and small buildings scattered around. But did Napoleon like it? A good question! Napoleon regarded Josephine’s taste in gardens as expensive, but he was generous, and he funded her plant-collecting projects. However, his idea of a garden designer was not Louis-Martin Berthault – Josephine’s choice – but Pierre Fontaine, who preferred straight lines and imposing avenues to the twists and turns of the so-called English garden.